Hip Hop/Gospel/Neo soul band Poor Legacy from Waterbury, CT, have just released their new single 'World Issues'. The group is comprised of frontman Nailz, D-Note (keyboardist) and E-Rhythm (Drummer). The song 'World Issues' is also part of an 8 track single with different versions of the song. 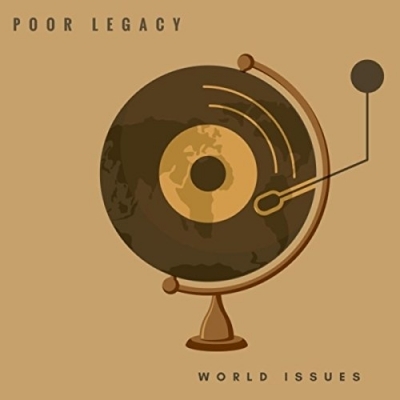 Read More Hip Hop/Gospel/Neo soul band Poor Legacy from Waterbury, CT, have just released their new single 'World Issues'. The group is comprised of frontman Nailz, D-Note (keyboardist) and E-Rhythm (Drummer). The song 'World Issues' is also part of an 8 track single with different versions of the song. Nailz aka "Da Sound Selector", born Berll Pemberton, was the catalyst for the group's formation. The rapper began performing at the age of twelve. Over the years, Nailz performed in various shows at after school programs in Waterbury. Along the way, through God's divine order, he met cousins Danny Edwards (D-Note) and Eric Kee (E-Rhythm). The three artists formed POOR LEGACY shortly thereafter. For years, the group has been recording music relentlessly. Major setbacks such as computer hard drive crashes and theft attempted to impede upon the group's progress. Thankfully, the group has forged ahead through it all with an unshakable faith to spread their music and message to the world. One of POOR LEGACY's biggest moments was in 2004 when the group was a finalist in the McDonalds GospelFest at Hofstra University in Hempstead, NY. That breakout performance led to an opportunity to perform at Madison Square Garden. After years of molding their gifts, POOR LEGACY released their first album, "No Compromise", in 2011. The group continues to gain momentum as they are set to release their second full length album.